Never saw LexisNexis as a company that would include in its mission to serve the American lawyer or the public which lawyers in turn serve. The latest evidence is LexisNexis’s threat to Baltimore e-discovery lawyer, W. Lawrence Wescott II. A threat that resulted in Wescott shuttering his well respected and award winning Electronic Discovery Blog (.png as blog as been taken offline). 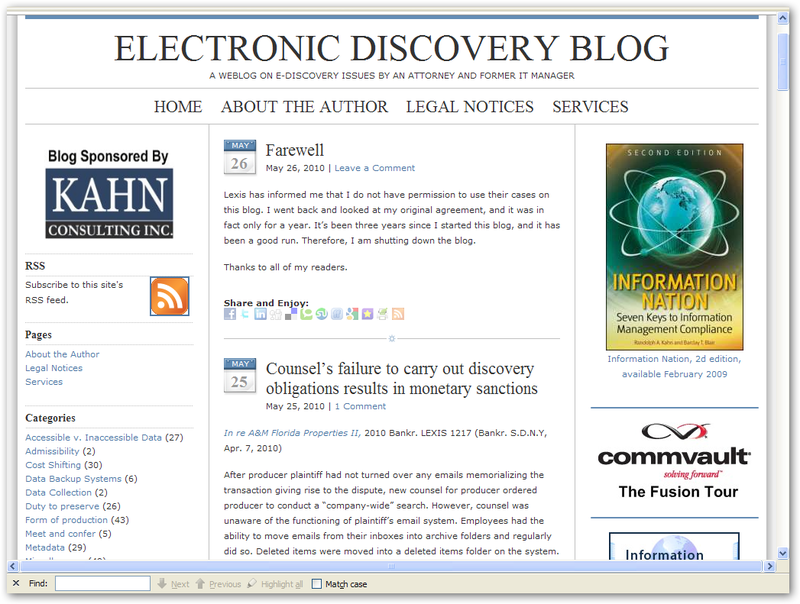 Until [May 26], the URL www.electronicdiscoveryblog.com led to a blog on e-discovery law written by lawyer W. Lawrence Wescott II. Today, that blog is gone. Wescott took it down after a lawyer from LexisNexis threatened legal action over a claimed unauthorized use of LexisNexis cases. The blog was among the ABA Journal Blawg 100 honorees in 2007. Per Ambrogi, when Wescott started the blog, Wescott contacted LexisNexis and was given written permission to post up to 1,000 cases for a year. From the Web Archive of Wescott’s blog, it appears that permission was granted in LexisNexis in 2007. Maybe it was the year running from 2007 that expired? Maybe it was threats from companies focused on serving lawyers and the public, which companies are making our law more accessible (reasonable cost or free) than LexisNexis does that made for the change of heart on LexisNexis’ part? Maybe LexisNexis will explain in a comment here?